Arroz à Grega (Greek-style rice) is a complete meal! It can be served as the main dish, you can serve it all by itself, or as a side. If you haven’t cooked the carrots within the Rice, cook the carrot in small pieces in boiled water. Chop the onions with an Electric Chopper and garlic finely (or use this Minced Garlic ). Place a large Non-stick Frying Pan over medium heat and add the oil. Add the chopped onions, garlic and salt. Sauté until translucent, soft and fragrant, stirring constantly to not let brown. 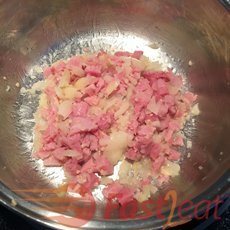 Add the smoked cubed Ham (or sausage or smoked turkey breast, or other processed meat) to the pan and stir. For a vegetarian version, skip this step. 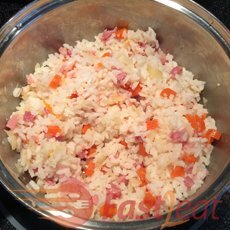 Fluff cooked Rice* with a fork and pour over the ham. 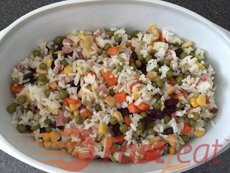 Mix in the carrot (if not already cooked in the rice), Raisins (or Craisins Dried Cranberries ), sweet corn, peas, and green onions. Serve it hot (sprinkled with Grated Parmesan Cheese on top, if desired) by itself as a main dish or as a side. Unlike plain rice, it can be also purposed to be eaten cold or room temperature. *Use fresh cooked or Left-over Brazilian Style Rice Fast2eat Recipe. STORAGE: Greek rice can be refrigerated for up to 3-4 days. It won’t be the same but cooled rice can be frozen in a Ziploc bag or airtight container for up to 3 months. Rice taken from a fridge should be heated in its own individual serving amount using microwave or streaming. Other differences include what is added to the rice before the raisins and vegetables (might include biological coloring and even lentils, soy sauce, or rosemary), and how the rice is cooked. Use your imagination.